A dentist is a specialist who works to diagnose, treat, and prevent oral health problems. Your dentist has completed at least eight years of schooling, and received either a DDS (Doctor of Dental Surgery) degree, or a DMD (Doctor of Dental Medicine) degree. If your doctor is a pediatric dentist, this means that he or she specializes in caring for children from infancy through their teen years. A pediatric dentist has received the proper education and training needed to work with young kids. Your teeth may feel fine, but it’s still important to see the dentist regularly because problems can exist without you knowing. Your smile’s appearance is important, and your dentist can help keep your smile healthy and looking beautiful. 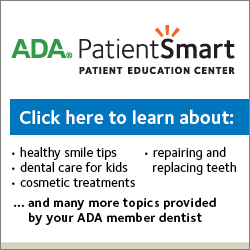 The American Academy of Pediatric Dentistry (AAPD) recommends that children first see a dentist as early as six months of age and no later than one year of age. During this time, your child’s baby teeth will be coming in and your dentist can examine the health of your child’s first few teeth. After the first visit, be sure to schedule regular checkups every six months. A filling is a synthetic material that your dentist uses to fill a cavity after all of the tooth decay has been removed. Fillings do not generally hurt because your dentist will numb your mouth with an anesthetic. Fillings are made from a variety of different materials. If you need a filling, be sure to talk to your doctor about what type is best for you and your teeth. Simply call the dental center with which you are established. (View our Dental Center Listing page) Our front desk staff will be happy to help schedule your next dental appointment. If you are a new patient, please call 877.313.6232 to register.